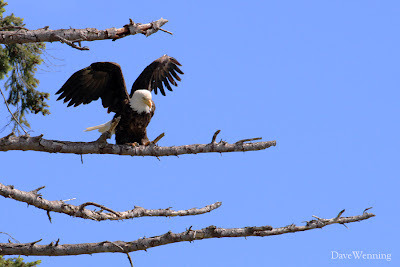 From Wild Fidalgo, a Bald Eagle lifts off from a hunting perch on the western shore of Similk Bay. The bird flew across the bay to Skagit Island where there may be a nest site. I often see them heading over there. The most interesting thing in the sky this day was the wildlife. Amazing shot!Have a great weekend! chubskulit, NatureStop, Linnea, thank you. I found you on Nature Blog Network .. very nice pictures you have here and a great blog ... It is fun to watch with you .. have registered with you and watch over again ..